There are many people who use Excel quite seldom and mostly for their home purporses. Excel has some options which perfectly fit your work, doesn`t it? But are you sure you really need all of them? How often do you use 3rd level equations? So why do you pay for what you don`t use? 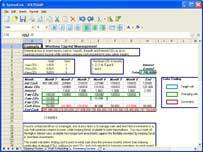 Excel is a complicated program with lots of options for big money. We offer you new SpreadCalc - a handy utility with most often used options for more than a humble price.